I finally got this quilt off to my brand new niece (i gave you a sneak peak here), so I can now show it in all it's glory. I like the quilt itself, but I just love the color combination which was inspired by a quilt seen here. Nettie, this is absolutely stunning. I agree, the colour combination is so fresh and inspiring. I would never have thought to put those colours together but they work just perfectly. What a lucky little niece you have! That's the third princess and the pea quilt I've seen in as many days. Now IIIII want to get some fabric and make one too. Too bad I don't know any little girls! Wonderful, Nettie! Love the colors. SUPER SUPER cute! What a lucky niece! I love the more golden colours as opposed to the bright oranges. Just lovely. 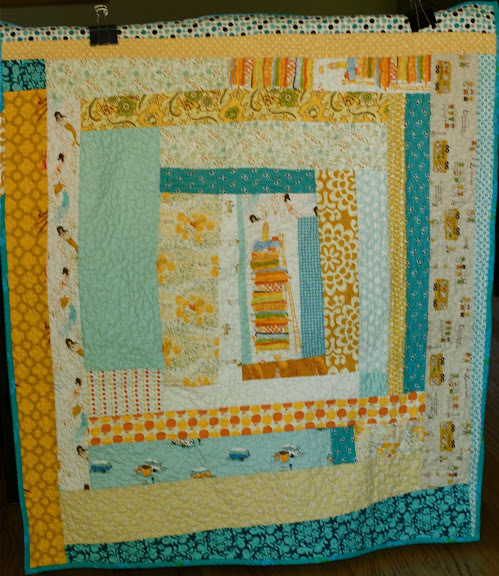 what a sweet quilt nettie!! 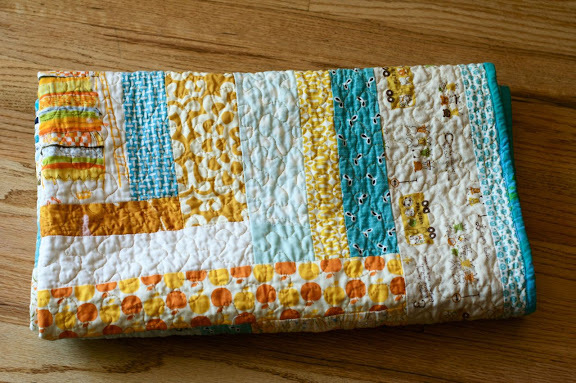 That is such a sweet quilt! I have not seen one like it. And what great colors. so lovely! what is the beautiful fabric to the left of the princess? It's a large block, flowery - in the second picture it's 2nd from the left. Gorgeous! I love the colours and layout. Love love love love it!!!. Super Super Cute. It is very lovely , gorgeous colours . Great job on your baby quilt. I too love the color combination. I love your name. My great-grandmother's name was Nettie and I always thought it was a nice name. Wow i love the colors!!! So pretty! The colors are lovely!! You really did a lovely job on the quilt! 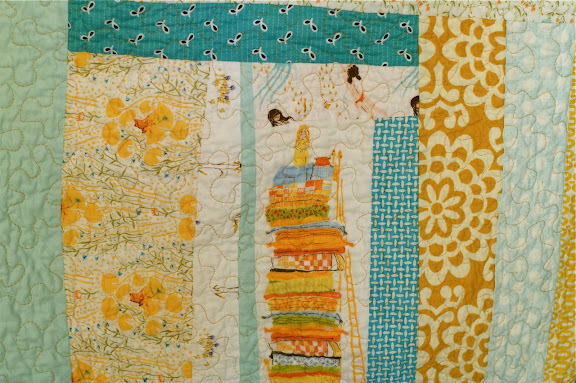 What a lovely quilt - I love those little school buses! The recipient is a blessed! I just love this! So pretty. Hope you're feeling well! Great color combination! 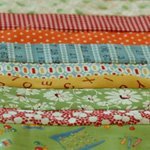 Love that princess and the pea fabric - even if I'm not the princess type. Actually, as I typed that, I realized that I have a cool print of a painting of the princess and the pea on my quilting room wall done by a Danish artist! Oh it's such a gorgeous quilt in every way. Both of these quilts are great - you certainly have been busy. beautiful quilt. I like the quilting you chose. Thanks for sharing it with us. La estafa automotriz MAS grande en Morelia, Michoacan, Mexico. Porfavor, tengan mucho cuidado y NO hagan negocios con www.expoautos.con.mx y www.globalbit.con.mx porque lo que parece barrato te va salir carrisimo! A veces una onza de prevencion sale mejor que creer a un tipo llamado Omar Garcia Millan y sus promesas que nunca se cumplen. PIENSATELO ANTES DE HACER NEGOCIOS CON ESTE LADRON OMAR GARCIA MILLAN! ALL your quilts look awesome!! I love the colors in this quilt.....they are inspiring me! Great job. Way cute !!!! Love it Nettie. Love this quilt !! So great !! Just when is this baby due. It seems to be interfering with the quilt production!! Incredibly beautiful! I adore the colors... Just so impressed! She will treasure this forever.